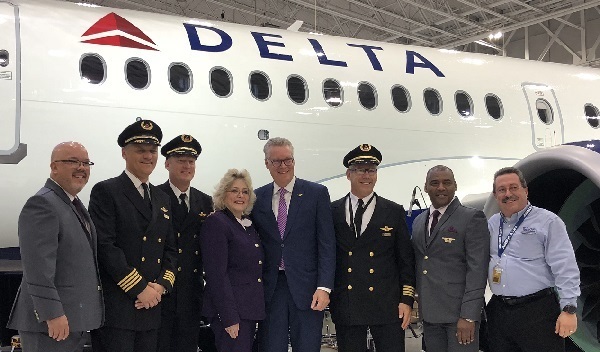 The airline celebrated the aircraft’s arrival by sharing a sneak peek of the modern interior with Delta staff as it also marked the 10th-anniversary of its merger with Northwest. Features of the new aircraft include a 109-seat configuration with seating for 12 in First Class, 15 in Delta Comfort+ (Business Class) and 82 in the main cabin and a state-of-the-art interior with seat-back screens and Gogo 2Ku wi-fi. Other innovations offer high-capacity overhead bins, extra-large windows and full-spectrum LED ambient lighting, plus what Delta claims to be seats among the widest of any narrow-body aircraft. In the main cabin for example, passengers will find seats 18.6in wide in a 2x3 layout while each customer will have personal power ports and free premium entertainment on the screens.